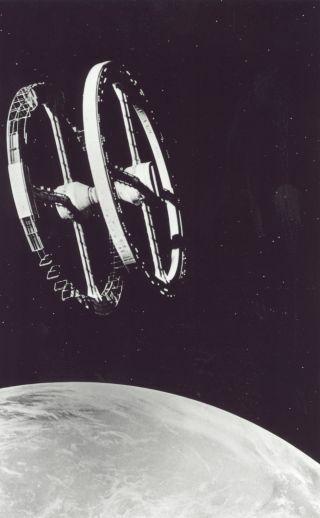 The space station from the movie "2001: A Space Odyssey." Syfy is adapting Arthur C. Clarke's much lauded novel, "3001: The Final Odyssey" into a television miniseries, the network announced Monday (Nov. 3). "3001," first published in 1997, is the final book in Clarke's "Odyssey" series that began with "2001: A Space Odyssey," which was originally published in 1968, the same year the movie of the same name directed by Stanley Kubrick was released. "3001" follows the story of Frank Poole, the astronaut killed by the HAL 9000 computer in "2001." Ridley Scott has signed as an executive producer for the project. "I have always been a fan of Clarke’s extraordinary 'Odyssey' series, and certainly Kubrick’s adaptation of 2001," Scott said in a SyFy statement. "I am thrilled to be part of bringing that legacy to audiences and continuing the great cinematic tradition that this story and its creators deserve." Clarke died in 2008, and Kubrick died in 1999. The estates of both men support the "3001" project, according to Syfy.